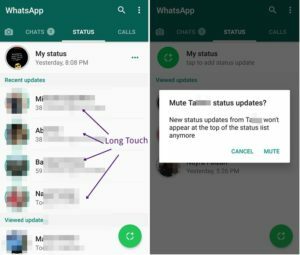 WhatsApp has recently added a new feature in its app the WhatsApp status. While many people are disgruntled by this new update and want to revert back to the original status that was very simple and straight forward to add, others especially the younger lot love it because now they can add photos, videos as well as GIFs to their statuses. 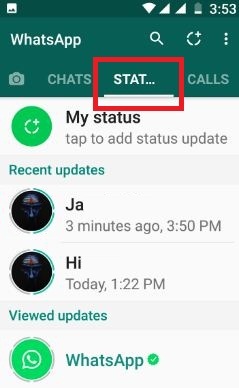 So now the status is not just a boring and mundane text message that you just upload and only people who would view your WhatsApp profile (which nobody does) can view. 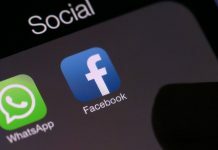 So why did WhatsApp, an already very popular and happening App, would incorporate a new feature within it. And it is not a very small change, it is huge as it adds a new tab in your WhatsApp hompage as you can see in the screen shot of WhatsApp home below. As we all know that it is the age of change. New apps and gadgets are being developed every day. There is no shortage of instant messaging Apps. Skype, Viber, imo all provide features similar to WhatsApp. 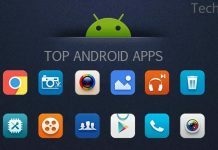 Hence in order to keep your App alive and prevent it from being replaced with something better and with more utility, in it is inevitable that apps continue to upgrade and new features are added regularly. That quite simply sums up the reason behind the incorporation of this new feature in WhatsApp. 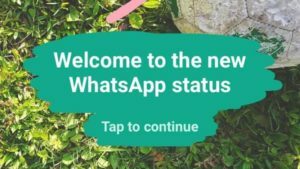 What’s new about WhatsApp Status? If you are a SnapChat user you can easily see that WhatsApp status is a complete rip off of the SnapChat stories. 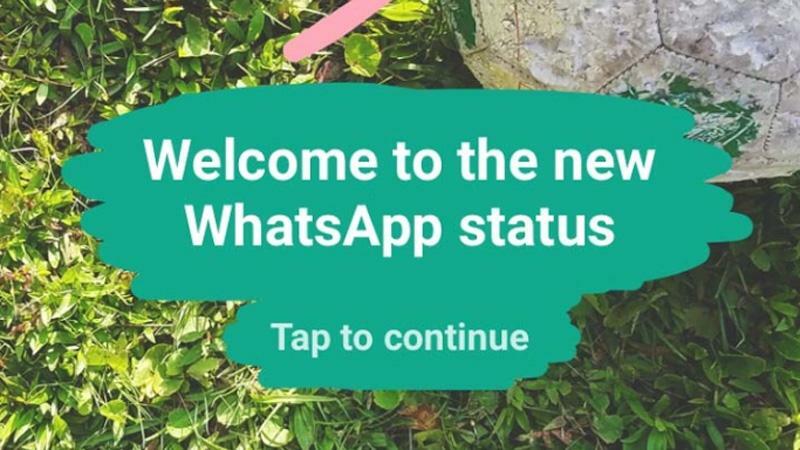 Earlier Instagram stories stole their idea and added it as an additional feature in their App now WhatsApp has also added to option to add photos, videos and GIFs in your status updates. This lets people let their friends and family know what they have been up to the whole day. The status will automatically disappear after twenty four hours. All this sounds familiar, well of course it is. This same thing has been the distinguishing feature of SnapChat. SnapChat has been posing as a great competitor to WhatsApp. Especially the younger lot liked to use SnapChat, as WhatsApp was considered for their parents. With the new status option WhatsApp likes to outdo SnapChat. 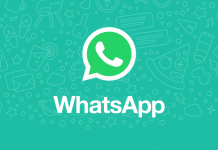 read more Skype vs WhatsApp: which one is better? How does the WhatsApp status feature work? It is quite simple. Just go to the status tab. Take a new photo or select one from your WhatsApp media gallery. Click to take a picture and hold to record a video. Once you have taken the picture or recorded the video, WhatsApp offers you some options to edit the videos and pics. The pictures can be cropped to your liking. You can choose from a long list of emojis to add to your pictures. You can change the size position as well as color of the emojis to your liking. Then there is also the option to add text or doodles to your pictures. The photo editing options are not what you would get at instagram but they do cover the comprehensive basics. The status updates will disappear after twenty four hours automatically and you are ready to have another status. You can also add newer status when your previous status has not been cleared off yet. You can have more than one videos and photos at a time in the status. All the status photos and videos that have not completed twenty four hours will be displayed in your status. Who can view your WhatsApp status? 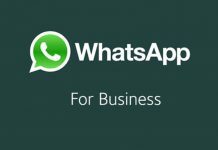 By default all the people in your WhatsApp contact list would be able to view your status. However there are privacy settings and before you update the status WhatsApp asks you to determine who can view your status. You can choose from everybody or everybody except, in which you can select the contacts with whom you are not comfortable sharing your WhatsApp status. There is also the share with option. 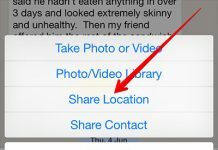 If you just want few people to view your status, you can manually add their names in the share with option. There is a read recipient option. If you have enabled it you can see who has viewed your status but if it is disabled you cannot see who has seen your status. If the other person has disabled their read recipient option, you will not know whether they have seen your status or not. Once you have updated the status, it will become visible to people whom you have allowed to view your status. 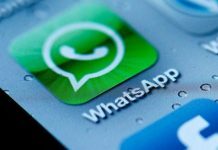 How to check WhatsApp status of other people? In order to check out the status of people, go to the status tab. There you can check the recently updated statuses. If you do not want to see the statuses of a particular person, you can mute that person’s status. Once muted, the contact’s status updates will not come at the top of the status screen list. Although the statuses disappear after twenty four hours but you can manually delete the status also if required. For this, go to the status screen. Tap on the three dots that are next to my status. Now tap and hold the status and a trash can and a forward option will appear at the top of the screen. Click the trash can and the status will be deleted. 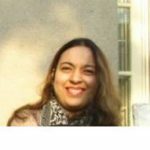 Click on the image of the eye next to the status. This will show the people who have already viewed your status update. 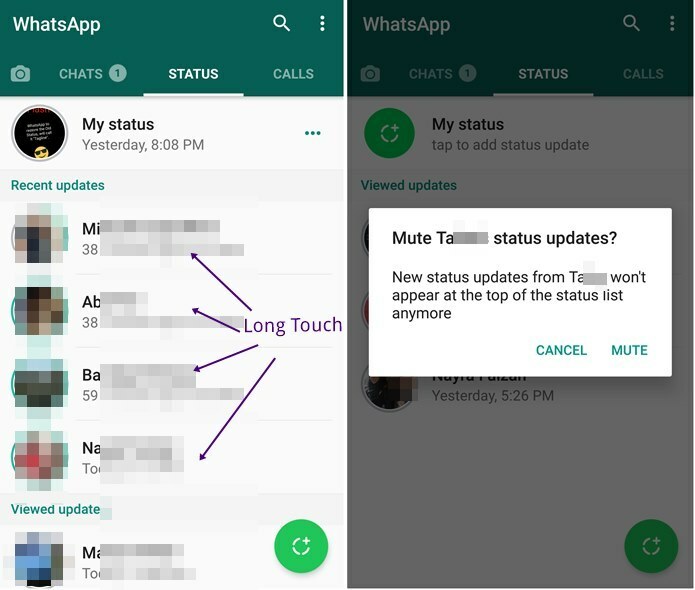 So this new feature definitely makes WhatsApp more attractive to certain users. 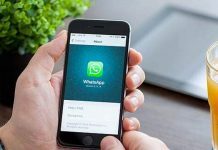 Although many still do not see any use of it but people who have regularly used SnapChat might now want to try out WhatsApp. 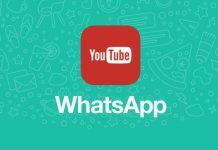 Have you used WhatsApp Status? What do you think about its utility? 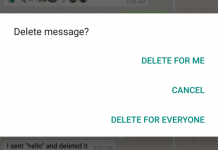 The Most Awaited WhatsApp Feature Is Finally Here!